New systems can save you money and make your place more secure and safe. As technology enters every part of our lives, there’s one area that is now getting a lot of attention: our homes. 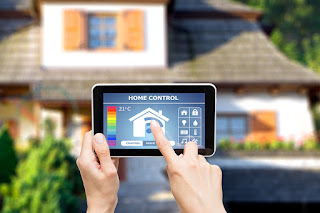 With automatic lighting, video cameras and thermostats, among other smart systems, we can make our homes safer, more secure and more cost effective. We can use technology to do our bidding. From the comfort of your couch, you can turn on and off the television and lamps, raise or lower the blinds, and instruct the thermostat to cool down or heat up your home. Recently the Hartford and the MIT AgeLab identified the top 10 home technologies for homeowners age 50 and older. Technology can make life easier for anyone, but a safer environment that can save money can especially benefit older adults. The latest instruments do more than monitor your home for smoke and carbon monoxide. They can detect just about anything in the air: carbon dioxide and monoxide, temperature, humidity, dust, soot, pollen, air staleness, pollution and other particulates. When you’re home, smart detectors alert you with an alarm or loud recorded voice, and when you’re away, they communicate through your smartphone app. One detector system will contact assistance (including the fire department) if you’re not home. In the past, to see who was knocking at your front door, you looked through a pinhole opening in the door (or peeked from the curtains at the front window). Now windowless doorbell cameras, more commonly known as video doorbells, use installed cameras to show you, whether you’re in the backyard, in bed or at work (using your smartphone), who’s at your door. You can even communicate with the visitor, telling the delivery person, for example, to leave the package on the front porch. Some video systems have motion sensors that activate the camera. One system takes videos of your front door, so if a package goes missing, you can peruse the videos for information. Another system will alert more than one person, so your children, for instance, know what’s going on. Video doorbells are especially good for those who live alone or homeowners who travel a lot. Instead of using a key to unlock your home, you punch your personal code into the lock box. Not only does this eliminate the need for keys, which can be lost, it provides access for others, such as your children who may need to check on you, friends who volunteered to water your plants, or services (such as cleaning) that come when you’re not home. You can also use a temporary code and then change it when necessary. If you don’t like coming home to darkness, or if you want to turn on the lights while you’re away, you can now adjust your lights using your smartphone, a preset timer, a key fob, a remote control or an exterior motion detector. This technology is available for both outdoor and indoor lights, and you can use it when at home or away. When you’re traveling, you may have nightmares about arriving home to burst pipes and a flooded house. However, smart shut-off valves will automatically turn off your water if they detect a burst pipe. Plus, you will receive an alert, via your smartphone, wherever you are. More expensive technology goes even further. One system automatically turns off the valve to the water main when certain weather conditions are forecast, such as freezing temperatures. There’s no need to get up in the middle of the night if you hear a strange noise in your backyard. Smart home security systems use motion sensors to detect if someone is near your doors or windows, and then transmit this information to you through your smartphone. You can even monitor your home when you’re away. More complex systems include surveillance cameras, lights and sirens, and allow you to turn on the lights when motion is detected, unlock your doors when a smoke alarm goes off, and start a video recording when a sensor is triggered. You can oversee the system yourself or hire a professional agency to do it. You can use these plugs on any outlet to remotely turn on and off any appliance. This convenience can save energy costs and improve security by letting you turn on lamps, for example, to make it look like someone is home. Some smart plugs even let you monitor your power consumption in real time. In addition to programming your thermostat for ideal comfort throughout the day, you can remotely control it. If you’re on your way home and want to warm up the house, you can increase the temperature using your smartphone. The high-end smart thermostats even learn your habits and temperature preferences and can set up the ideal home environment without you having to lift a finger. Some let you know how much money you’re saving on energy costs by regulating the temperature. These sensors can detect water leaks and, in some cases, small changes in moisture levels that could indicate mold—whether from your refrigerator, toilet or washing machine. Place battery-operated sensors around the appliances you want to monitor. They will alert you via your web browser, smartphone app, text, email or phone call when leaks occur. While raising and lowering window blinds is not a difficult chore, doing so remotely can save energy costs and add to your home’s security. Smart blinds can permit more or less sun—and warmth--depending on the weather. And closed blinds can deter possible burglars who might assume the house is occupied, even when it’s not. With so much smart home technology available, you can choose to try out a few at a time or you can install a whole safe-home system that integrates all the pieces. “New Research By the Hartford and the MIT AgeLab Reveals Top 10 Smart Home Technologies For Mature Homeowners,” Nov. 29, 2016, Hartford Newsroom. “The Best Smart Home Security Systems of 2017,” Feb. 15, 2017, PC Mag. “8 Best Video Doorbells,” April 2017, Wiki.ez.vid.